It's taken a while for astute conditioner Mark Kavanagh to get the best from talented sprinter We're Gonna Rock, who was in top form at Flemington on Saturday when beating a slick field to win the Group III VRC Bobbie Lewis Quality. Last seen when finishing second to Black Caviar in the Group I SAJC Goodwood Handicap back in May, six year-old We're Gonna Rock resumed from a winter break to outgun Spirit of Boom and score a tenacious win in the 1200 metre sprint with Michael Rodd in the saddle. 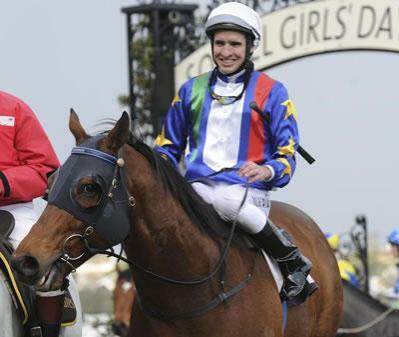 "Gelding him has made all the difference,” revealed Mark Kavanagh. "He was a massive horse and was just too big for his knees and joints… and there was too much thinking, now there's no thinking and he is not too big, so he runs accordingly." When asked about spring goals for the sprinter, Kavanagh kept his options open. "There's a race for everyone in the spring and it's just a matter of us finding the right races for him,” he said. Winning rider Michael Rodd was well pleased with We're Gonna Rock. "Early in the piece we were always confident he could win a Group I and he's been close a few times, so it was good to see him get here and win today in a quality field,” Rodd said. Blessed with great natural talent, We're Gonna Rock has shown flashes of brilliance during his 15 start career including a good second to More Joyous in the Group I MRC Toorak Handicap and may yet crack it for a win at the highest level judging by his current form. A $180,000 Inglis Easter purchase from the Yarraman Park draft, We're Gonna Rock has won five races and more than $450,000 in prizemoney with the promise of more to come. We're Gonna Rock is by reigning champion sire Fastnet Rock and is from the Dehere (USA) mare Harrow, a half-sister to Group I winners Bluebird the Word and Porto Roca, who has achieved international fame as the dam of Group I Dubai World Cup winner Monterosso.